This week, with the Sun still in Gemini, your heightened powers of observation and the whirring mind that arises may exceed your ability to remain fully present. You may become lost in thought, distanced from the activity in the world by a veil of heavy contemplation. This week, the Sun and Mercury in Gemini will oppose Saturn, a strong presence that will overshadow your sense of self with a feeling of solitude. Whether this solitude is experienced as a cold and lonely exile or as a quiet space for deep reflection will depend upon on you. To feel alone can seem like a great punishment. But it can also be a great gift for anyone who seeks to know the depths of their own soul. It is a part of the human condition to confront the fact of loneliness at times. But it is also a part of the human condition to realize how much strain and distraction is created by trying to adhere to social order. Getting caught up in the goals and mandates of the collective often demands the sacrifice of your sense of individual purpose. When this occurs, you experience the worst kind of alienation, which is to lose your sense of self. Without a sense of individual perspective and the time for inner exploration, creativity fades, revelation is stifled and all novelty becomes lost. If you are anything like the great Romantic poet, Lord Byron, then you most likely feel quite blissful about experiencing solitude in nature. Solitude can also feel like alienation and discontent. 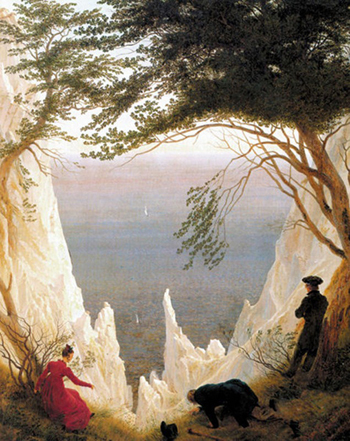 To Lord Byron, loneliness was an experience felt in the midst of other people. In the social world, competing ideologies can certainly overwhelm any sense of human connection. In the human world, solitude is felt as the absence of love. In Lord Byron’s time and in our own, the paradigm of industrialism has forced a dichotomy between nature and the civilized human world. Nature has become an idyllic abstraction and the human world is experienced as a lonely place of exile. In the natural world, the quiet space within is nourished by a sense of divine order and transcendent beauty. Poems are born as wordless feelings, peace is felt in every breath, and divinity becomes apparent. In these environs, solitude is a great gift. But it can also offer a luminous glimpse of inner space, where the light of creative power is exalted like the birth of a dancing star. Thus, this week, you may experience strange clouds of loneliness, but it is in these withdrawn moments that a new journey of self realization can begin. In your solitude, set the intention to harmonize your relationship with nature, discovering the hidden attributes of your Earthly power: that which you were born from, that which is intrinsic to you. At the beginning of the week, Mercury will be trine to Jupiter in Libra and square to Neptune in Pisces. Because Jupiter is newly direct, there will be an exceptional ebullience and optimism present in your thoughts. Use this wave of inspiration to muse and meander in and out of daydreams. Keep in mind that Mercury’s square with Neptune might be creatively inspiring, but life may seem quite surreal. Expect some hints of strangeness and synchronicity to reveal themselves. The middle of the week is characterized by the Sun in Gemini’s exact opposition to Saturn in Sagittarius. When the Sun, the center of self and the light of vitality, comes into a hard aspect with the austere gaze of Saturn, you will most likely feel a great strain. Expect to experience obstacles and delays which dampen your ability to fully express yourself. With Saturn in Sagittarius glowering down at the Sun in Gemini, you may feel like a lot of your brilliant ideas are being suffocated and strangled by harsh judgement. Under a feeling of great restriction, with less ability to express yourself, it will be quite common to experience a sense of separation between yourself and others. Under these conditions, it is best to seek some solitude for the purpose of engaging in profound introspection. The time you spend alone does not require refuge in the wilderness, but please do dedicate a certain period to quiet meditation and contemplation. The Sun/Saturn opposition will illuminate the areas of your life where you feel most impeded and limited. Despite the gloomy feelings that you may encounter in response to these impediments, remember that this level of insight is a great opportunity. It is in these darker quieter moments that your spirit grows to meet the challenges that lay ahead. On Friday, Neptune, the planet of transcendental experience, will turn retrograde in Pisces, changing the drift of its current. Neptune’s shift in direction will change what you accept about reality, often waking you up from a lingering daydream that you may have been living in. The waning Moon will be conjunct Neptune as it changes direction, heightening the emotional sensitivity of this day. The Moon and Neptune conjunct in Pisces will open you to the surrounding energies in such a way that you will want to consider your choice of environment and company very carefully. The solitude sought earlier in the week will still be of great benefit to you at this time, for a palpable feeling of vulnerability is likely. There are blessings from the combination of the Moon and Neptune for sure. The window to your imagination will be thrown wide open! You might use this immersive combination of energy to totally submerge yourself in the sensorial experience of music and art. Or you might experience a sense of unity with the spirit of a fragrant garden or dissolve into the waters of a shining lake. Whatever you do on Friday, make it beautiful and refreshing to your soul! On Sunday, a few days after the Sun’s tense opposition, Mercury will also oppose Saturn in Sagittarius, summoning the same themes and issues of restriction that arose in the middle of the week. Fortunately, Mercury’s intelligent agility will begin to respond. Mercury in Gemini, so full of valuable information, will begin to flutter with constructive solutions and logical plans to circumvent many of the current obstructions to your happiness. Mercury in Gemini sees information as neutral, meaning that all experiences are gleaned for valuable lessons and insights. Thus, with Mercury so actively responding to your sense of limitation, even your disillusionment will act as an asset. Simultaneously, the Sun in Gemini will now be sextile to Uranus in Aries, offering you the brightly lit torch of inspired invention! This is the moment of awakening that will allow you to liberate yourself from the restraints that Saturn made you so grossly aware of in the middle of the week. Whatever happens, know that you do have the spirit and the courage to embrace the change that needs to happen.